Good Day! Hope you had a nice Memorial Day weekend. We took our Boy Scout Troop on a “Peace Begins With Me” pilgrimage to all six churches in our parish over the weekend. 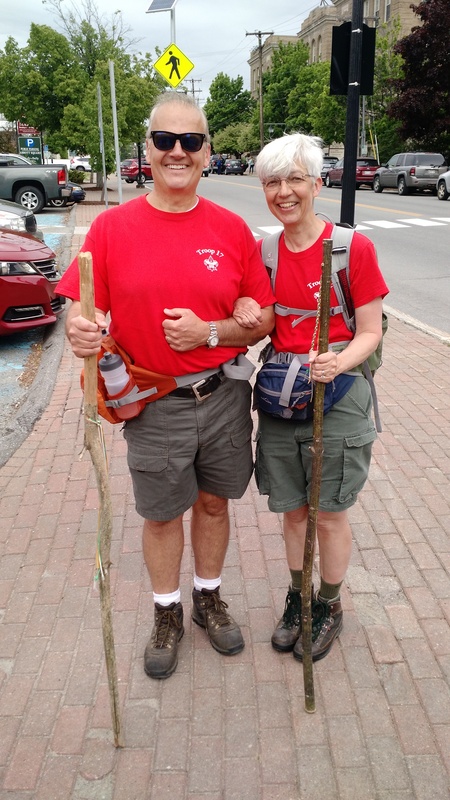 The three day hike encompassed four towns and covered 26 miles. At each church, I stamped their homemade “passports” with a different “peace” themed stamp (all Stampin’ Up! stamps) and everyone received a Holy Medal of the church’s namesake Saint to hang on their walking sticks. It was such a great experience. We’re already planning next year’s pilgrimage! From Lao_Tse, a chinese philosopher from 6 B.C. We went out for brunch on Mother’s Day with some of my husbands family. One of my sister-in-laws totally surprised me with a box of beautiful white chocolate and dark chocolate dipped strawberries. I wanted to make a strawberry themed thank you card for her, so I used today’s “Case This Sketch” challenge for inspiration. 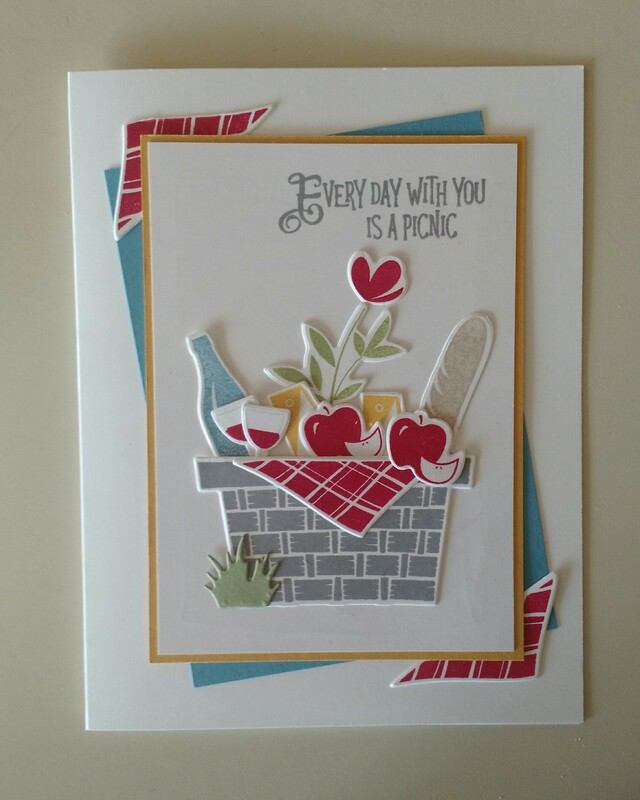 For this card I used the old “Market Fresh” stamp set for the strawberries. I masked off part of the stamp and just stamped the fruit and not the sentiment that is above it on the stamp. 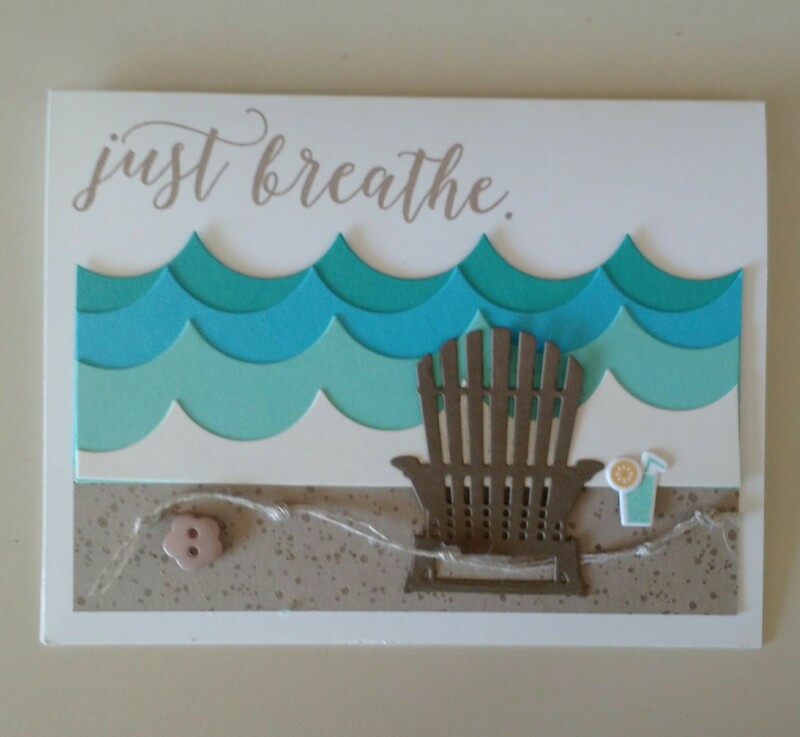 The sentiment comes from the “So Many Shells” stamp set. I used Wink of Stella (a glitter pen) for the very first time on the red strawberries. It adds a fun touch! I tried to add a lemon lime twist bow above the red strawberries (which are popped up on dimensionals) but it surprisingly didn’t look good. 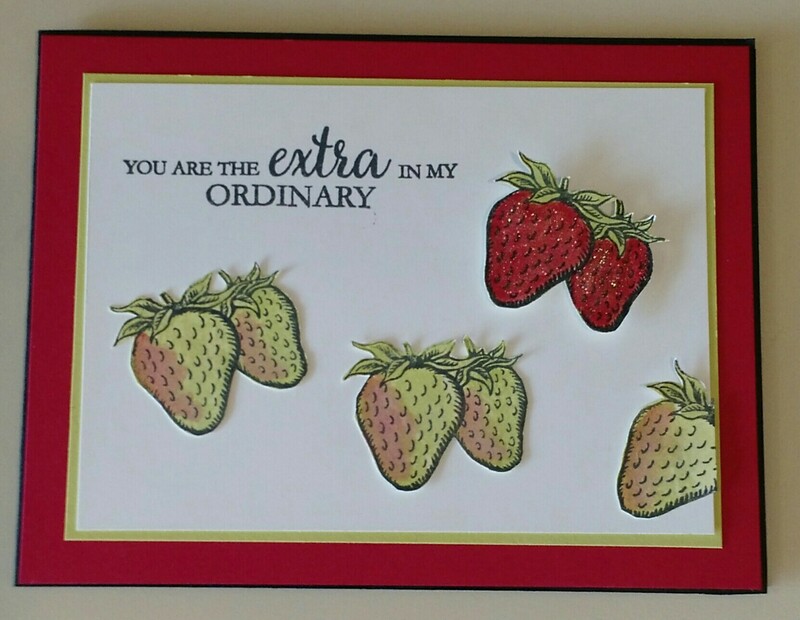 All the strawberries I painted with the Stampin’ Up! aquabrush. Hi Stamping Friends! I hope everyone had a wonderful Mother’s Day Weekend! 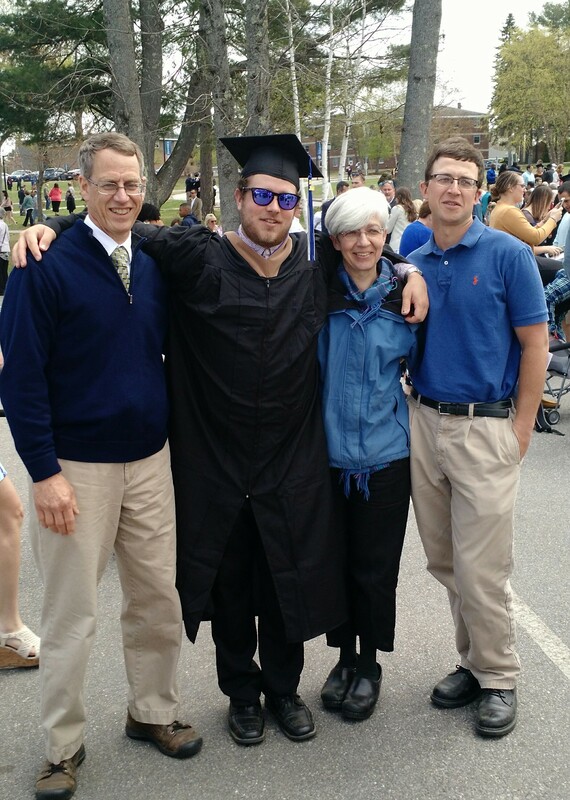 We were away for our godson’s graduation from St. Joseph’s College and it was alot of fun. That’s my hubby, Tim, on the left and my oldest son, Jonathan, on the right. The day after, my college friend, Miss Pat, arrived from California. 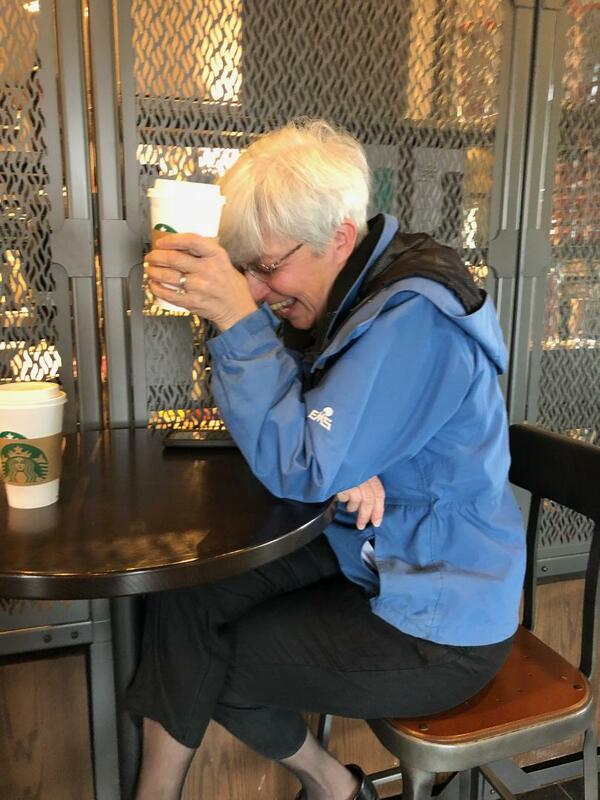 Our first stop was Starbucks, and the madness began…too much fun! She was here for a funeral so we only got one night together, but I loaded all my stamping gear in the trunk, drove south to a quaint little Bed and Breakfast called the Brewster Inn in Freeport (home of L.L. Bean) and we made cards, including the one posted today. That is the stamp set I chose with my Demonstrator Credit for sales during Sale-A-Bration. 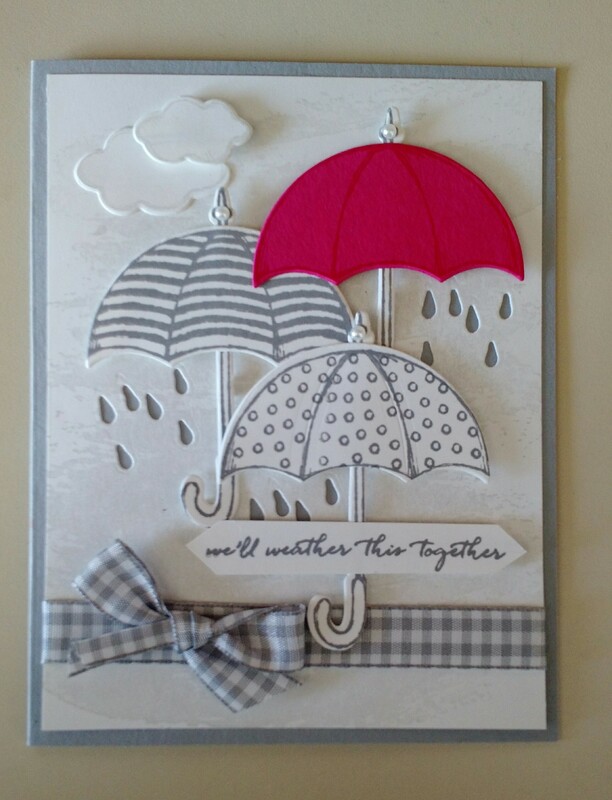 It’s called “Weather Together” and the coordinating dies are called “Umbrella Weather”. We were talking and laughing so much, I forgot to slant the raindrops on the right. I used last years catalog photo for inspiration and added the Watercolor Wash Stamp for background texture and added the ribbon on the bottom. Good Morning Stampers! 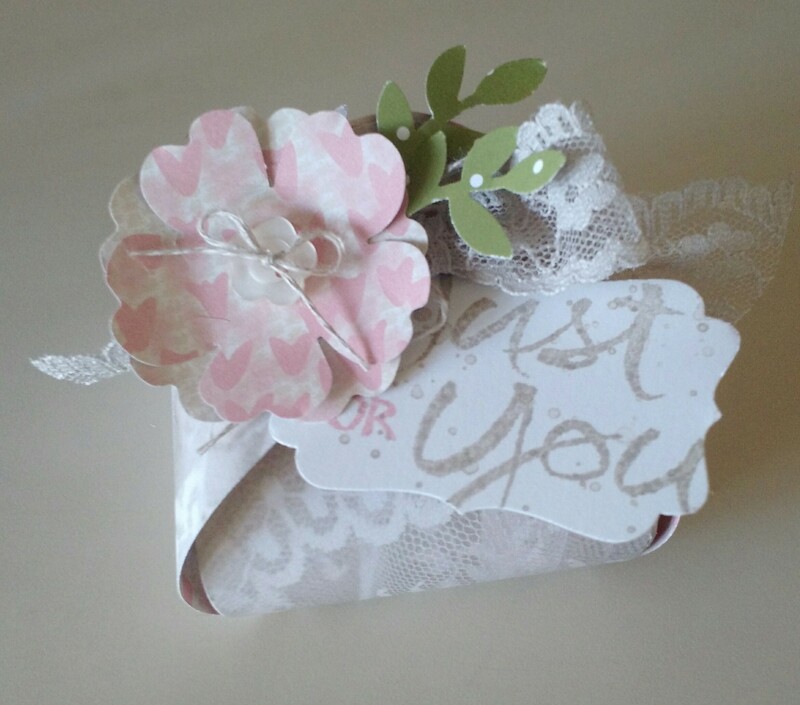 If you’ve been stamping for awhile, you’ll be familiar with this “Curvy Keepsake” Box (a retired die). The tag was made with the Watercolor Words Stamp Set, with a little “Gorgeous Grunge.” There’s a little “welcome to Maine” gift inside for my friend “Miss Pat” who is coming to Maine this weekend. It’s so much fun to make little surprises with our stamping hobby! 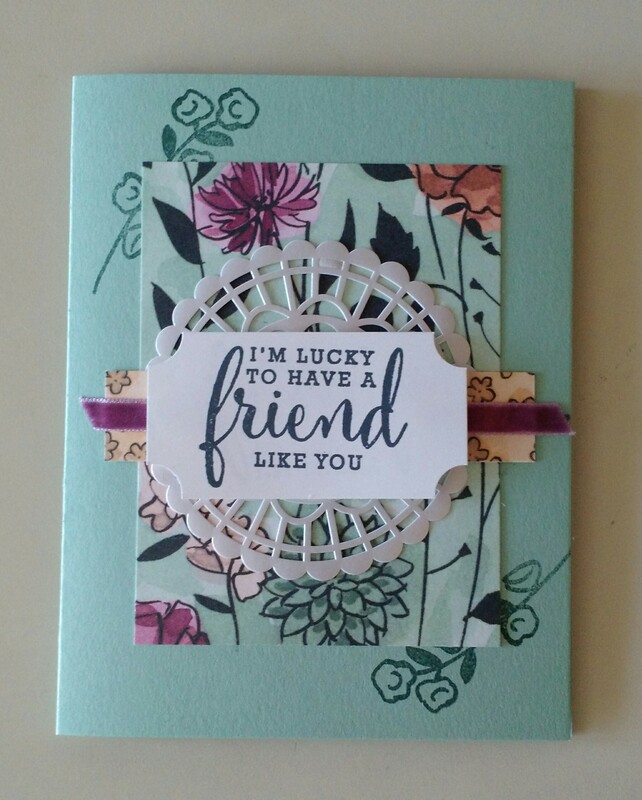 This card is a CASE from the new Stampin’ Up! catalog (p. 161), using the Colorful Seasons Stamp Set and the Seasonal Layers Thinlit Dies. It’s fun to think of the relaxing days of summer during the busy gardening days of spring! I have to start getting all our gardens ready to plant so I might be missing days of blogging here and there, but I’ll be thinking of you! Good Morning Stampers! Stamping class is this afternoon at 1:00 p.m. We’ll be making a Mother’s Day Card, an Easel Card and a Tulip Card. If you’d like to join us, just let me know! Thank you to Nancy Farrell in New York for this beautiful card. She made it at the OnStage event in Connecticut last month with products from the new bundles available this month. I meet such beautiful people through this blog!